Want to become a faster, fitter runner this year? No need to pile on the miles. Want to become a faster, fitter runner this year? No need to pile on the miles. "Unless you're an elite runner, it's not necessary to run more than three or four times per week," says Angela Park, a triathlon coach for Spark Multi-Sport in Chicago. "Mixing it up with cross-training will keep you motivated and more likely to get all of your workouts complete." Perks of cross-training include avoiding injury and burnout. Plus, by focusing on different muscle groups that you may not work when you run, you'll become a stronger athlete from top to bottom. "Once you establish your running goals and how often and what mileage you need to run to complete them, fit your cross-training around that schedule," suggests Park. This may mean tacking on yoga or a short swim after an easy run to aid recovery, or focusing on strength training on a day off in the middle of the week. "Or, if you're running just three days a week, do a spin class on the other days," says Park. Justin Harris, a track and field coach at Vassar College in Poughkeepsie, New York, agrees. "Keep trying different workouts until you find something that's just right." It's no secret that running takes a toll on your body. So it's key to complete low-impact workouts on days you don't run. "That way, you can give challenge yourself in a different way, get in a good workout, and still perform on your key run workouts," says Park. When he was training as a collegiate runner and later as a professional triathlete, Harris says he hopped around on different machines at the gym to break up the boredom. "On my off days, I'd do a 15-minute warm-up on the elliptical, five minutes on the bike, then do a workout on the bike, like 10 x 1-minute hard pedaling. Then I'd go back on the elliptical for 15 minutes," he says. "Combining machines also helps to add the necessary strength, mobility and balance you need as a runner." A pool can be a runner's best friend. 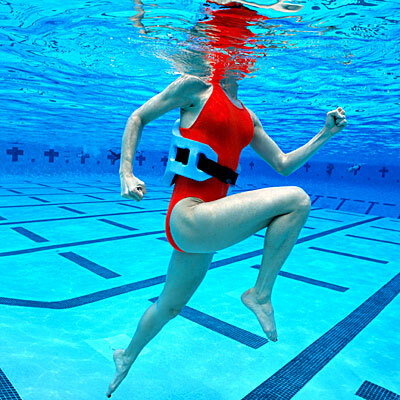 "We always use the pool as 'Plan B' for injured runners or those who just need some time off the roads," says Harris, adding that you can always replace a tempo run with a hard effort of aqua jogging. Park suggests trying an interval set, such as 10 x 30-second sprint with 30 seconds easy for recovery. "It's a challenge to run in the pool, and it can be a huge asset to run training." Or, don goggles and swim some laps. "On days when your legs are just exhausted from the mileage you have put in, you can jump in the pool for a couple thousand yards and work your body in an entirely different way," says Park. "A lot of runners are intimated by swimming, but it can be the ultimate recovery tool." "I recommend two swims per workout and one bike workout, no more than an hour long," says Park. "The goal is to challenge your body in a short period of time without the stress of running." No gym? No pool? You can still get a quality cross-training workout without having to leave your house. "Hip and core strengthening exercises, which are imperative for runners, can be done anywhere," says Park. Plank and crunch variations, push-ups and squats will make you stronger and prepare you for increased mileage. Or try this workout, which Harris often has his athletes do on their off days. Repeat this circuit 2 to 4 times, allowing a 3-minute break in between sets.